Besides group sessions, we also put a strong emphasis on individual development. Moreover, if it is needed, we can split up the groups, which already have low headcounts, even further for the duration of the sessions. 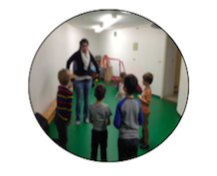 Based on the parents’ needs, we can provide opportunities for extracurricular sports and leisure activities in our own gym during working hours. The only exception is skiing, which obviously requires a different area and conditions. This saves time for the parents by eliminating the need to take the children to different sports clubs and cultural houses for additional sessions.